India is one of the few remaining countries in Asia that I haven’t managed to visit — until this year! That’s why you can imagine how stoked I was when I first found out that I’ll be setting foot in its soil; after all, I’ve heard a LOT of great things about India’s culture, food, people and sights. Back then though, when my itinerary was finalized, I checked the immigration requirements and… I was surprised when I discovered that I had to get an Indian visa first before entering the country. I say this because I once heard that there was a visa-on-arrival scheme to a lot of nationalities (such as mine), but apparently, by 2014 they have changed it into an online ETA (Electronic Travel Authorization) or E-Tourist Visa application. Top photo of Taj Mahal from Shutterstock.com» What is India’s E-Tourist Visa? This might sound like a hassle to you, but I assure you: it is very easy to apply for an Indian visa or E-Visa because the process is fast, simple and straightforward. I was successful in applying for this in just a day and below is an Indian visa guide that will also help you make you India travel dreams come true! NO ONE can give you a guarantee on your Indian visa’s approval — not even a lawyer, a consultant, a travel agent, or an embassy employee. Anyone who says otherwise is most likely going to be a scammer. That being said, what I can offer you here is a comprehensive guide with helpful tips to increase your chances of getting that Indian tourist visa. There are, of course, various types of Indian Visas that you can apply for, and with the E-Visa they have 3 categories (as I’ve already mentioned above): E-Tourist Visa, E-Business Visa, and E-Medical Visa. NOTE: If your point of entry to India is in another place that’s NOT listed above, you will then have to apply for an Indian Visa in the embassy that’s near you. I haven’t gone through such a procedure but you can find some info on the Indian Embassy’s website in your local (one example is this info [click] by Manila’s Indian Embassy). Your sole objective of visiting India must be for recreation (sightseeing or tours) or casual visit to see friends or relatives. (Remember that this tourist E-Visa is NOT allowed for employment purposes and NGO/volunteer activities. 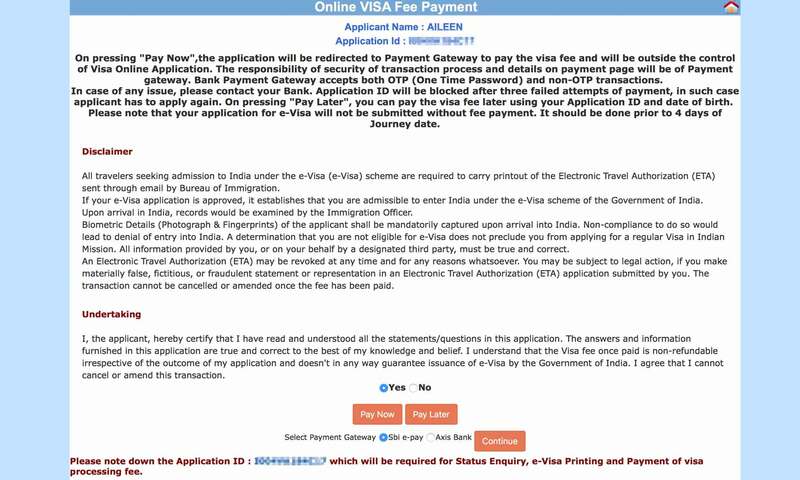 If you’re a journalist or if you’re visiting India for a conference, there is a separate visa for that which you can apply directly for at an Indian Embassy). You must have a return ticket or onward journey ticket, as well as sufficient money to spend during your stay in India. Once you’re sure that you ARE eligible to apply for an online tourist Indian Visa or e-Visa as based from the eligibility rules above, please proceed with the instructions below. NOTE: This must be in a .PDF file with a maximum size of 300kb. To learn how to make .PDF files, go here, and if you want to know how to compress .PDF files, read here. Make sure that when compressing, the details on your passport are not blurred and are still readable. NOTE: The photo must be a .JPEG file with a maximum size of 1MB. Make sure that the height and width of the photo is equal (either way, once you upload it, the website will help you crop the photo). NOTE: This is needed for filling out the ‘References in India’ section on the application form online. TIP: See here for a list of the best hotels in Delhi and the best hotels in Mumbai. NOTE: For debit cards, Visa, Mastercard and Maestro are accepted. For credit cards, Visa and MasterCard are accepted. The Government of India only does E-Visa applications through this website: indianvisaonline.gov.in. Take note that facilitation by any intermediary, agents, etc. is NOT required to process this kind of online Indian Visa. After all, it’s easy and it’s best that you do it yourself. 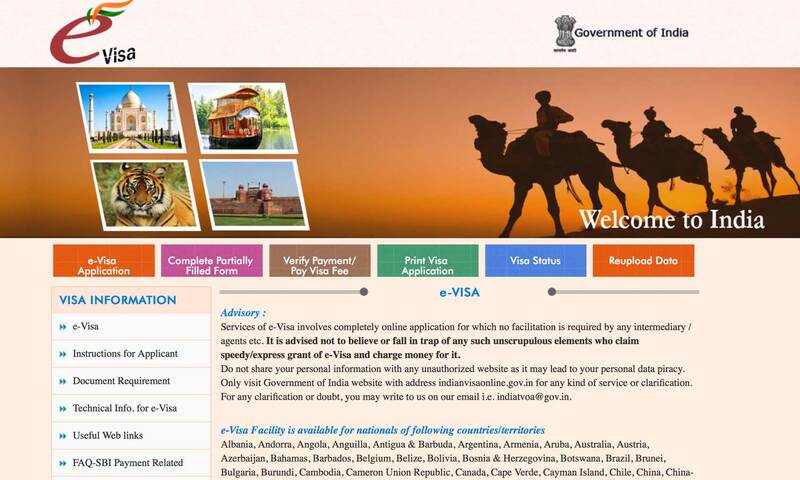 Visit the E-Visa website at indianvisaonline.gov.in. You must click the box beside “e-Tourist Visa“ — for the next prompt, select “Recreation/Sightseeing“ (or select the other options if it’s more applicable to your situation). Once done, check the box that says “I have read the instructions…” and then click the orange button that says “Continue”. Under “References”, for the section where it asks for a reference in India, if you’re not visiting a family or friend, you can enter here the details of the hotel that you’ll be staying with. If you’re staying at multiple hotels, you can mention the first one you’re staying on. If you’re wondering where to book a hotel, I suggest booking via Booking.com or Agoda.com. With them, you can book a hotel with NO pre-payment and you can even cancel the booking a day before your arrival with NO cancellation charges at all. So yes, you can make reservations without any payment, you can change the reservation anytime, and you can cancel them at no cost as well if in case your visa is not approved. There are 2 pages for this section, you can accomplish it all and click “Save and Continue” — or if you’re missing some info, you can “Save and Temporarily Exit”. Remember that once you click “Save and Continue“, you can NO longer change any of the information, so make sure you’ve got everything right. Once you’re finished with the long form, the next pages will ask you to upload your photo AND your passport’s bio page. Please take note of the specifications and file size limitations (as I’ve already previously mentioned in Step #2; rest assured, the page will remind you of such). The next step now will be to make the e-Visa fee payment… which I will discuss in the next section! The image below is what usually shows before you are directed to the payment portal. Click on the bullet that says “Yes”, click on “Pay Now”, and select “Sbi e-pay*”. SBI (State Bank of India) ePay and Axis are the banks that the Government of India uses to accept payments for the online Indian Visa applications. I chose SBI and I don’t think there’s much of a difference if I had chosen Axis. $50: Citizens of the majority of countries including Australia, Belgium, Brazil, Canada, China, Hong Kong, Finland, France, Germany, Hungary, Indonesia, Ireland, Israel, Jordan, Kenya, Malaysia, Mexico, Myanmar, the Netherlands, New Zealand, the Philippines, Poland, Portugal, Spain, Sweden, Taiwan, Thailand, Vietnam, etc. IMPORTANT: Payment of this fee is NOT a guarantee that your visa will be approved; it is also non-refundable. In case of any double/triple payments, it will be refunded after due reconciliation within seven (7) days. Either way, please be careful while doing the payment process because if the number of unsuccessful attempts is more than 3, you would have to start afresh and redo the whole application form again with a new application ID #. As for the payment status, it may take up to 4 hours before the status updates. But if the status is still not updated, you can verify the payment by going here. After you complete the whole online application, you’ll just have to wait for an email update from them that confirms that your E-Visa is “Granted”. If it is, they will proceed to send you your Electronic Travel Authorization or ETA. Normally, visa processing takes 72 hours — but I got mine a day after I applied online and that’s certainly fast. Below is the ETA that I received via email which allowed me to stay for 60 days in which the start date can be anytime within the next 4 months (I even got double entry rights). 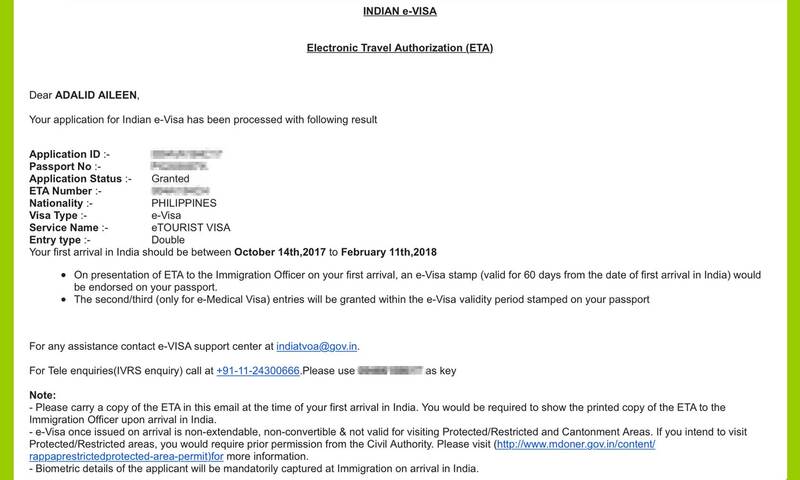 You need to print this ETA page out and bring it with you when you travel to India because it will serve as your papers once you’re at the immigration counter in the airport. As for my actual experience at Delhi’s immigration, they just took my biometrics (fingerprints and photo) and then asked for my ETA. They didn’t ask any more questions or supporting documents — but it’s still best that you bring it in case they ask for it. As for the time, it took me a total of 30 minutes to pass through immigration and that’s mainly because the lines were long. ◘◘ Do I need to purchase travel insurance? I highly advise that you get travel insurance for your trip to protect yourself from any unwanted hassles such as travel delay, lost baggage, accidents, etc. To avail, I would highly recommend World Nomads since they offer the best price and coverage. ◘◘ How long is the Indian Visa valid for? An E-Tourist visa is typically valid for 60 days with double-entry access. Take note that these visas are non-extendable and non-convertible. ◘◘ How often can I apply for an Indian e-Visa? ◘◘ When is the earliest time that I can apply for an Indian Visa online? You can apply at least 4 days before your trip — but not later than 120 days before. Go to this website and enter your application ID # and passport #. TIP: You can get a FREE pre-loaded SIM card with your e-VISA. If you’re landing in Delhi airport, you would just need go to the ITDC Counter to claim. To get there, turn right after you exit the baggage area and look for Ashok Travels & Tours which is basically the ITDC counter. Clearly, applying for an Indian Tourist Visa online is relatively easy and fast; with that, I hope that the tips and info that I’ve shared here will help guide you. If you’ve already applied for an Indian visa before, how was your experience? The great detailed with everything in it. Wow you really laid that all out in detail. India is on my bucket list so I'm pinning this for future reference. For many countries, applying for a visa can prove to be very tedious. I appreciate you sharing the process. It's important for anyone who is interested in visiting India to understand that it's not about just having a passport. What a great post full of really helpful information. We just came back from Mexico (we live in the US) and just going through customs there was a bit crazy. I would love to visit India one day and this information is really helping me see us do it sometime! Wow, such a great post and so detailed. I love how you went through the process with all of the steps and screen shots. I would recommend your post to anyone that is curious how to go about this process. The time you spent on this will definitely benefit many people. This is so interesting. I knew we needed a visa, but I’ve thought about the presses of getting one. Would totally be worth it though. I love to travel. This is cool Aileen. Much more convenient than when we did our India trip in 2013. We were in Kathmandu and had to head to the embassy in the city to get everything in order. I forget if it was 1 or 2 trips. Really though I have to be thankful for this stroke of good fortune because I ran into a travel blogger at the embassy who gave me the idea for Blogging From Paradise. We also got our visa too; win-win. Thanks for this post - very detailed. I have never been to India but after seeing movies like Victoria & Abdul, and the Best Exotic Marigold Hotel series, it is a place I'm sure is very beautiful. Perhaps some day I will be able to go! I've always wanted to visit India, I read several books based in India throughout my childhood, but with the films coming out like Victoria & Abdul, it makes me want to go more! I actually have a few friends I'd love to meet in person who live in India. This post is perfect for folks like me who really need things spelled out CLEARLY and made simple for travel tips- overseas travel can be really confusing!! Now when I ever start to plan a trip I have great tips on hand for easy visa application.